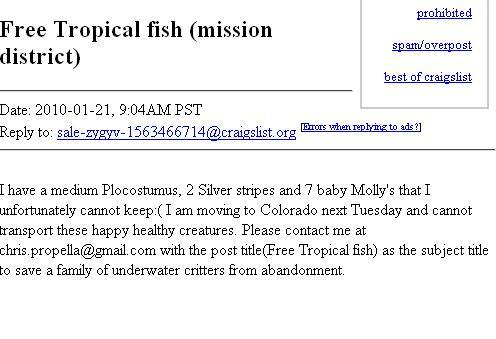 Om nom nom, free tropical fish!!! Posted on Craigslist this morning! GET YOURSELF AN MFING PLECOSTOMUS!!! IT’S FUN TO WATCH THEM EAT A FROZEN BROCCOLI FLOWER, PER WIKIPEDIA!!!! Available in the Mission, today.